Have you been suckered into buying and eating those “healthy” protein drinks/powders and bars loaded with sugar and stuff with names that you can’t pronounce. Yeah, me, too. When I read the above quote in Tiffany Terczak’s (Don’t Waste the Crumbs) new e-book, High Protein, No Powder: Protein Bars & Smoothies Made with Real Food, it brought back bad memories. Betrayal. That’s the same feeling I had a couple of years ago; it was the motivation that led me to give up processed foods, meat, and diary products*. I’d been mislead, lied to and manipulated not only by the food industry, but by the very government oversight agencies created to protect me. If you’re ready to kick the sugar- and chemical-laden junk that passes for “health” food but aren’t sure how to do it – you’ll want to own a copy of this book. High Protein, No Powder is exhaustively researched, eye-opening and yet an easy-to-read textbook on whole food nutrition. You’ll learn what foods you should avoid (including some that may surprise you) and what to eat instead. You’ll get simple and tasty recipes for smoothies and bars that you can put together in minutes. Tiffany shares her recipes, but more importantly, she provides the method so you can get in the kitchen and make your own healthy and delicious creations. I love having bars like these ready to go in the refrigerator for a quick snack or a boost post-workout. In under twenty minutes I had double batches of the Almond Coconut and Cafe Mocha bars ready to consume when I needed them. No sugar in there, no whey or soy protein isolate. Kel and I have a smoothie every morning and sometimes I’m short on inspiration. Tiffany’s recipes got me out of my rut and have me thinking about all kinds of combinations. Below we have protein-packed Nut Butter & Jam and creamy Chocolate Popeye. No heavy metals, no carrageenan, no scary artificial sweeteners. *High Protein, No Powder is not vegan. It includes cheese and dairy milks. Substitution suggestions are provided. Enter the giveaway below for your chance to win a copy of High Protein, No Powder. Be sure to visit Don’t Waste the Crumbs for other giveaways – including one for a Magimix Food Processor! I tend to make my own protein bars as well with oats and nut butters, but I do add pea protein powder as well… I’d love some new recipes for post-workout refuels! These bars are so easy to make. Thanks for commenting! I get most of my protein from legumes, nuts, and soy. Sounds good! I use protein shakes for the convenience, but I get my required amount of protein from soy products (usually tofu and soy yogurts), oats, quinoa, chickpeas, and far too many nuts (plus all the couple of grams here and there from vegetables add up more than people give them credit for! )… I certainly don’t struggle, but I’d love some easy whole food-based snack recipes so this e-book sounds great! I’ve never had a protein shake. I wonder if they’re not such a big thing in the UK, I’m certainly not that aware of them although I have seen them advertised in health food shops. Are they the stocked in supermarkets in the US, or just specialist stores? 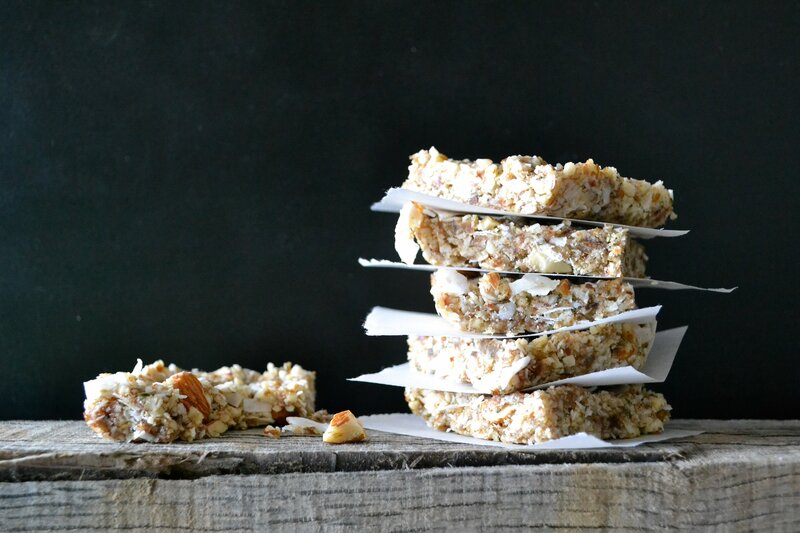 Your almond coconut and cafe mocha bars look very tempting. Folks in the UK just might be smarter than we are here – we are obsessed with protein! I LOVE snack bars..and I agree… most store bought ones are not as healthy as you’d think. I used to eat an Odwalla bar every day post-workout and then I noticed one bar was TWO servings…and it was loaded with sugar. Argh!! I was amazed to learn about the protein in greens! It’s like the best kept secret of protein! I’ve never had protein powder/ protein shakes but since beginning a proper work out routine I have started looking at how much protein I should be having etc. I have been increasing my intake of nuts, quinoa, dark greens and things like almond milk etc help. I dont really eat soya products very often though but might add some in! You have the right idea – stick with getting your protein from whole foods :-)! I love this book. I need to get my hands on it. I do use protein powders — but the list of the ones I’m willing to buy and feed the family is getting smaller and smaller. I know it. I wasn’t aware of some of the funky stuff in powders/bars until I read Tiffany’s book. Scary. Plus they’re expensive! Candy bars with vitamins thrown in. I used to love Clif bars. Now that I have reduced my sugar intake I can taste the incredible amount of sugar in them. Not necessary. Sounds like a great book! Woohoo for the tiny chia seed!! My favorite way to get protein is from beans. Almost all whole foods have protein (beans, nuts/seeds, whole grains, vegetables, and fruit – yes fruit! ); that’s how I get mine! Quick question: Do these recipes use refined sugars? I define refined sugars as including honey, agave, maple syrup, and any other highly concentrated sweetener. Hi Carry! There are NO refined sugars used in these recipes. The bars and smoothies are naturally sweetened with dates and/or whole, fresh fruits. Book looks great – thanks for the giveaway!! You’re welcome, Diane! Thank you! I also use hemp protein – – a good whole food in my book! I’d love to check this book out. I use Sunwarrior raw vegan powder for my smoothies, but it would be nice to have some bars to grab when I’m hungry and don’t have time. And “betrayed” is such a good word! They don’t care about our health—in fact, I’m pretty sure they want us to get ill so the pharma companies can make more money off of us later on. Call me paranoid, but I don’t want to find out I’m right the hard way! Apparently I’m the only person on the planet who hasn’t tried Sunwarrior ;-). Nope. You aren’t paranoid – you’re exactly right. There’s no money to be made from people who “treat” themselves with whole, nutritious foods. Beans and legumes, nuts and seeds are my favourites. I treat myself to tofu and tempeh on occasion too (I’m a poor student and they’re on the pricier side!). My thoughts when it comes to most protein powders: Yikes! Scary! Though i do like a good scoop or two of hemp protein from time to time! I’m all for this approach: simple, real foods incorporated into your daily foods that offer some great sources of protein! Thanks for a great review, Annie! I like tvp for a quick protein option. I always forget about TVP! Thanks for commenting, Hannah. Years ago I had a naturopath put me on a diet that basically consisted of a bunch of protein bars and shakes. A couple of months into it I thought ‘hang on a second, this doesn’t feel right, and since then I have been so skeptical about them. Nothing beats natural and home-made I say. Oh, and I stopped seeing her after that too! Good gut instincts! Sounds as if she was more interested in getting you on a food plan than helping you get healthy. I don’t really like protein bars, but the book looks pretty interesting! No problem for you getting protein :-)! My favorite way to get protein is through greens, nut butters, hemo seeds and tempeh! Isn’t it amazing that greens have protein?! I love that! Thank you SO much for your super kind words Annie! Your bar and smoothie renditions look delicious, and I’m so glad you liked them. I really appreciate you sharing my book with your readers, and I hope they like it as much as we do! My pleasure, Tiffany! I think your book has struck a chord! Congratulations! Let me know what else I can do. LOVEEE getting my nutrients from real food, this book sounds amazing..as do those protein bars! Tofu is my alltime fave way to get protein! I like to get protein from hemp and sunflower seeds. They’re so easy to add to other dishes. I get my protein from plants! Pretty much everything I eat has protein, so I don’t worry about it. I’m with you, Terri. I don’t worry about it. Chai seeds in my shake and mushroon stroganoff. Yum! Love those little seeds!